If you do't see your model listed, send us an email to sales@holbren.com and we'll see what your options are. 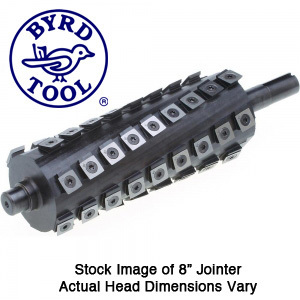 The ultimate woodworking upgrade for any woodworking jointer is a Byrd Shelix spiral cutter head with four-sided solid carbide inserts. No modifications are needed for a smooth and easy installation because each Shelix cutterhead is factory-machined to exact dimensions. Do-it-yourself projects are easier because Byrd Shelix long life solid carbide cutters can provide tearout free cuts in figured wood. Other benefits include reduced noise, improved chip collection and no more need for setting knives. Proudly made in Kentucky, each Byrd jointer head is made of U.S. tool steel with the inserts made with the finest European carbide. Byrd started the revolution and stayed true to American manufacturing by delivering the Byrd Shelix spiral cutter, a true quality product. Click on the image to get complete specifications.